Yes I suppose the title can be written the other way around and it probably was for a good part of my life. I did create, but something was missing. Like a cog that didn’t engage the wheel that was trying to turn. Something was not right and I had to abandon where I was. However, I knew I would go back, just didn’t know when, just knew that it wouldn’t be the same. I have been an artist of sort all of my life starting with drawing horses since I could remember, which is about 5. I wore through many pencils and many sheets of paper. I even remember saying to my Mom that I wanted to be an artist when I grew up. I drew horses every chance I got and then entered in the paint-by-number sets, which were of course, were animals. I think I got a set of clowns to paint once, never did finish that one. Here’s the kick: I never thought of myself as creative. Yes I drew, but that was “nothing”. I painted my paint sets, but that was only painting according to numbers. I didn’t knit or crochet even though I knew how. Therefore, I wasn’t creative. Somewhere along the way I picked up that if I didn’t knit or crochet like everyone else, I wasn’t creative. And if creative meant making hats out of bleach bottles, or lampshades from egg cartons, I sure as hell wasn’t taking on that label. It was in July 2000 , in the Saskatoon airport, flying home from seeing my Dad alive for the last time, I picked up a set of earrings. As I looked at those earrings, I thought that I could do “this”. 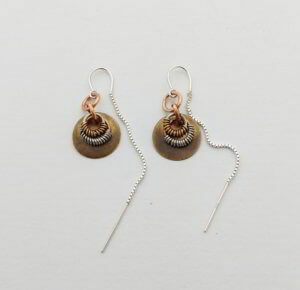 I bought the earrings and some time after I got home I started making jewelry. What I didn’t know at the time, is that I was starting on my creative journey, a journey that has taken me where I never thought I would go. The earrings started my creative journey. Since finding those earrings I have traveled through wire-wrapping, beadwork, knitting, crocheting, and have discovered myself neck deep in lampworking glass. 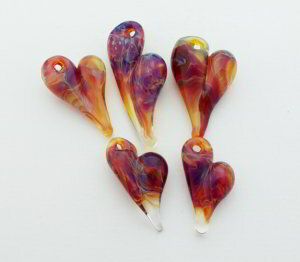 (Lampwork means to melt, shape, and blow glass by means of a torch rather than a furnace.) I took classes in beadmaking from various well-known artists and even though I loved the classes and loved learning, I realized one truth. I didn’t like making beads. Rather, I didn’t like cleaning the mandrels that the beads were made on, so let’s eliminate that annoyance, shall we? I changed the type of glass I was using and started learning how to craft it. Because I had an excess of crafted pieces, I started to sell. 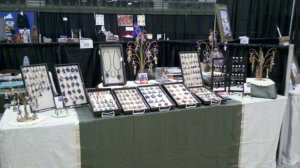 Craft shows, farmer’s markets, a bit online, and by word of mouth. During that process, I made a mistake, actually a couple of them. I turned my hobby that paid for itself into a business. I tried to follow the money. That was mistake #1. Mistake #2 was shifting from creating what I wanted to making what will sell or hope to sell. The “should do this”, “should make that”, “should sell here” came raining down and I started drowning in it. As a result, my sales tanked and I pulled the pin on my glass art. I stopped doing the shows, selling online, and stopped making. I walked away unhappy knowing what I was doing wasn’t where I wanted (or needed) to be. I needed a change of perspective and a change of heart, but what I didn’t know at the time is where that change would be spawned from. Table showcasing my glass art at a craft fair. In the meantime and for some strange reason, I started to run. Don’t know why, just knew that I had to do it. And not short distances like 5 or 10K, but the long stuff like half marathon to start. If training runs were too short, I was left feeling owly and like I wasn’t finished yet. Maybe I wasn’t. Through running I started to discover me. I spent countless hours with my own company and I almost craved it. Through the beats of my feet I started to discover what came natural, what felt right, and what didn’t. I discovered my strengths and learned not to force the weaknesses. In running I had tapped into the flow where time almost stands still. What I discovered from running has spilled over into my creative life. I picked up a knitting project, a ruffled scarf, that I had set aside a few years ago and completed it. 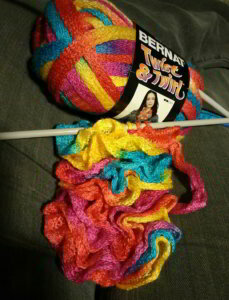 Through this completion and starting another very bright and colourful scarf, the meaning of knitting came clear to me. To me, knitting isn’t to make a scarf (or whatever), it’s an avenue to get lost in the colour and texture of the yarn. In other words, knitting allows me to shut off the world (and squirrels) and to be in the present moment. Much like running. Ruffle scarf I am knitting. A few short weeks ago and I’m not sure exactly what the instigation was, but I had the urge to go back into my glass studio, fire up the torch and create. I wanted to make the hearts. Pick a colour, try this, what if? For the first time in a long time, I created a brand new batch of hearts, ones that I thought of as gorgeous. There were a few in that batch that I felt could be brighter, more colourful, more out in the world. Those hearts I put back into kiln, on a hunch for temperature, time, and cycles, I hoped for the best. What came out was what I had longed for, had tried and failed so many many times in the past, but this time it worked. I went through my stock on hand, picked out the pieces I felt could benefit from more kiln time, and tried again. Some remained the same, some responded, and some needed even more attention. As I looked at the re-born pieces I was in awe of how strikingly beautiful those pieces were. Never before have I been taken aback by my own work. In that moment I was free. Free from the “not good enough”, “will they like”, “will it sell”, and all of the other baggage of the past. In a sense through this process I have been re-born as an artist or maybe the “re” isn’t meant to be in front of the “born”. 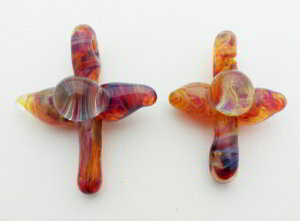 Cross Pendants after more time in the kiln. Now the pieces I will make are ones that I’m inspired to make. Hearts are my anchor, my creative lifeline. There are pieces that I love to make and I will continue to make. There are ideas that rattle amongst the squirrels that when the time is right, I will plunk myself at my torch and figure out how to bring the idea to life. I know now both what and how to create. As for stepping out into the world, to share my work, I have a new (and more me) plan, one that I am excited about. 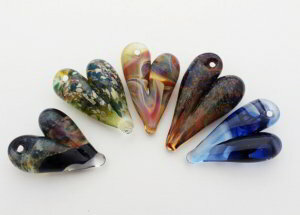 Heart Pendants after more time in the kiln. What happened to the earrings that I picked up in the Saskatoon airport so many years ago? I made an adjustment to them to have them a wearing style that I like, put them on, and they’ve been there since. They too are my connection to my creative life. 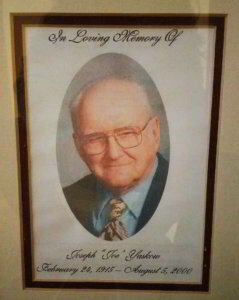 And my Dad. What a beautiful depiction of your journey! Thanks for sharing.